This whimsical favor with two adorable babies snuggled in a pod is an apt way to herald the anticipated arrivals. It’s an ideal favor for a twins’ baby shower or indeed any baby themed event. 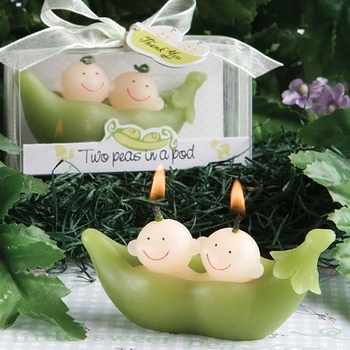 Fun and cute, these candles will be much appreciated for their visual charm. Measuring 3 1/4 x 1 3/4 inches, each favor contains twin babies candles with a single strand of hair serving as wicks, crouched in a green pod. Comes in a clear box tied with a white ribbon with a "Thank You" tag. Please note: The "Thank You" tag pictured in the photo above cannot be personalized. Custom Personalized Tags or Stickers can be purchased ($.35 each favor) if you would like to add your own special note to each box for your guests.